For many years, I lived in a one-bedroom Manhattan apartment. Visitors often commented on how neat it was, and how organized I was. I loved the look and feel of my organized space, and how well it fit my needs. When it was time to sell that apartment, my realtor told me I was the only client she’d ever had who didn’t need to declutter first. You might think that I would have carried my organizational talents and tendencies into my new home. But I didn’t. It wasn’t just a new home that I got, but a new life. I went from a small apartment to a big house, from the city to the suburbs, from single life to marriage and motherhood, all in just a couple of years. My dreams had come true, but it was all a bit overwhelming. And while I was adjusting to my new life, I let my organizing systems slide. Serious disorganization set in after I had my second child and we moved into our second house, all in a six week time frame. I felt terrible. How could my house be so disorganized? I knew I could do better, but I was exhausted and overwhelmed. The road back to my former, organized state seemed very long and hard. The turning point came when I gave up on the idea that I had to fix everything at once. When I accepted that I could make progress in smaller increments, and that it would be OK if getting back on track took some time, everything changed. I set off on my journey back to an organized home, knowing that it might be a long trip, and being okay with that fact. It relieved a tremendous amount of stress, and actually freed me to move forward. Today I have safely arrived at “Destination Organization,” as Aby calls it. The clutter is under control, and my house works much more efficiently. If you’re feeling overwhelmed by the clutter in your home, here are some tips that helped me as I set out on my journey and also to stay the course. Begin with small projects that have a big impact. I started in highly visible spots, like the kitchen counter, because those areas were constant, nagging reminders of my disorganization. It didn’t take a lot of time or effort to bring some order to those areas, but this progress made me feel much better and motivated me to keep moving. Match your expectations to your situation. It wasn’t too hard for a naturally neat person like me to keep a small apartment ultra-organized. But my house was bigger and home to more people, including young children who were busy playing, exploring, and learning—exactly what I wanted them to be doing! Yes, my house needed to be organized, but not to the extent my apartment had been. I aimed to cut the clutter and make my space work for my family’s needs. As a formerly organized person, I had a pretty good idea of how to organize my house, once I finally began. Even so, I found that getting help really speeded me along. For me, that help came from simplify101. The classes inspired me to take on more spaces and bigger projects; the forums gave me virtual friends who provided encouragement and good ideas. Together, they made my journey faster and more fun! Do small tasks right away, and do them all the way. I made a conscious effort to stop putting off small tasks. In a similar vein, I made a point of doing those tasks completely. For instance, instead of tossing a sweater on my bed to put away later, I took a few extra seconds to put it back in the drawer where it belonged. The cumulative effect of these habits was huge. Block out some nightly organizing time. We started Family Cleanup Time, immediately after dinner. Before the kids headed upstairs, we all made sure their toys and books were put away. The investment of just a few minutes every night meant that the messes never got out of control, alleviating my former overwhelmed feelings. Make it easy for kids to put their things away. In my house, this meant two things: lots of open bins (so it was quick and easy to toss items in) and minimal sorting (the train stuff all went in one bin, for instance—we didn’t bother separating the tracks from the engines). 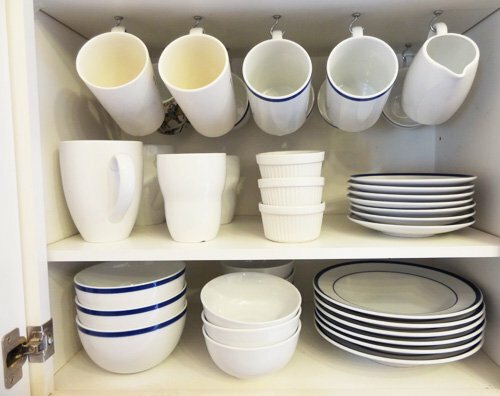 These are the steps that put me on the path back to an organized home. Your path might be different, but the important thing is to take those first steps! 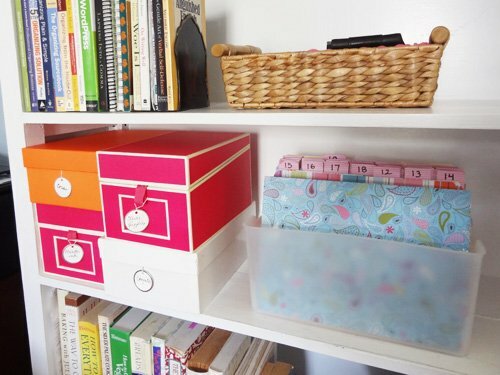 What has helped you get started on an organizing project? Please share your thoughts in the comments. I’d love to hear! Thanks so much for sharing your story, Nancy. I especially love your point about doing small tasks right away, and doing them all the way. That’s a hard one for me to always do, but you’re so right that the cumulative effect is huge! Thank you, Jennifer! I had to work to develop those habits but they really have helped me a lot. I spy a tickler file! Love it. Haha, yes. It has served me well! I too struggle with keeping organized in a house full of boys. One thing that helps that is similar to your do small tasks all the way, is repeating the mantra “Don’t put it down, put it away” every time I am tempted to just dump something; and by extension, making sure that everything has a home in the first place. I like the way you phrased it…I know what you mean about making it a mantra. Even though I know this practice makes a huge difference, often my first impulse is still to drop things on a desk, or counter, or wherever. I do have to constantly remind myself. Fortunately, I usually heed my reminders. Insightful story! I like how colourful your organizing systems are. Thank you! I do love hot pink! I love the advice to take care of things right away, I feel like that could help me tremendously. I feel like the reason I don’t do that now though is for fear of getting distracted. For instance if I’m cleaning the upstairs and I have something that goes in the basement I set it at the top of the stairs worried that if I take the time to go down there I’ll be sidetracked, so instead it ends up sitting at the top of the stairs and then often something will happen like a phone call or the kids need something and I run downstairs leaving whatever it was parked at the top of the stairs for longer then I’d like. Any advice? Yes, I know what you mean about the distractions but I think of your example as something slightly different. For me, “do it now” and “do it all the way” are mostly about individual tasks. So, for instance, putting that sweater away, filing a paper instead of putting it on my desk for later. Your example seems to be more of a project, with more steps involved overall. So in that case, I would advise against taking the thing down to the basement right away because your focus is on the cleaning project. Say your project is clearing off a dresser–getting it cleared off and neat is what you’d focus on immediately; you don’t want to be distracted from that. Moving items that don’t belong on the dresser to their proper homes downstairs is more like Part 2, or a separate project. Does that make sense?